Saiu hoje mesmo. 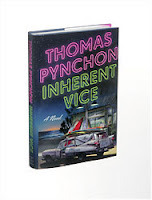 É um novo livro do bizarro, popish, Thomas Pynchon, intitulado “Inherent Vice”, da Penguin Press. De acordo com o crítico do NY Times, Michiko Kakutani é : "... a big, clunky time machine of a novel that transports us back to the early 1970s, back to a California of surfers and surf bunnies, bikers and biker chicks, hippies, freaks and righteous potheads. It was a time when people lived for Acapulco gold and Panama red and lived on pizza and Hostess Twinkies, a time when girls wore their hair long and their skirts short, guys wore paisley and velour and suede, and people were constantly monitoring their paranoia levels and worrying about narcs and cops and the feds." De fazer crescer água na boca aos fãs de outras obras de Pynchon como "The Crying of Lot 49" “Gravity’s Rainbow”, “V.” ou “Mason & Dixon”. Mais uma torrencial descrição do universo em que pontificava Bob Dylan, com resquícios de Jack Kerouac.